This product is designed to etch concrete or masonry surfaces prior to coating or sealing. No need to rinse prior to sealing. MasonrySaver No-Rinse Concrete Etch is a hydrofluoric acid-etching material designed for etching and coloring concrete surfaces prior to coating or sealing. A thin film of Etch will etch any silica-containing surface in as little as 15 seconds. Because of its unique chemistry, a surface treated with MasonrySaver No-Rinse Concrete Etch does not need to be rinsed prior to sealing. After using MasonrySaver No-Rinse Concrete Etch, a protective sealer such as MasonrySaver Decorative Concrete Sealer may be applied directly over theetched surface once the substrate has completely dried. 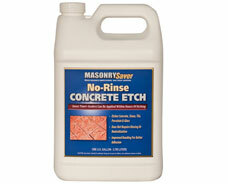 Use MasonrySaver No-Rinse Concrete Etch to etch and color concrete, brick or masonry surfaces prior to sealing. The etching properties of the product allow the user to seal the surface, once it has been properly stained, without the need for further preparation or rinsing. From Anonymous of Decatur, Georgia on 9/22/2018 .